We are an experienced name, which is engaged in manufacturing and supplying Two Line Dose Feeder. The outlets of our Two Line Dose Feeder are connected parallel. 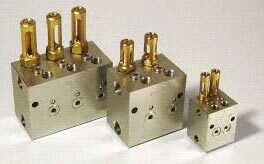 Moreover, the outlet ports are connected to lubrication points by means of tubing. The functioning of entire equipment can be noticed by the movement of indicating pin. We make available Model TLDF 2, 4, 6, 8 and 10 Outlet with respect to output in CC like 2.3 & 5 CC/outlet/cycle.